Have you found an online vendor selling Ron Quorhum 12-Year? 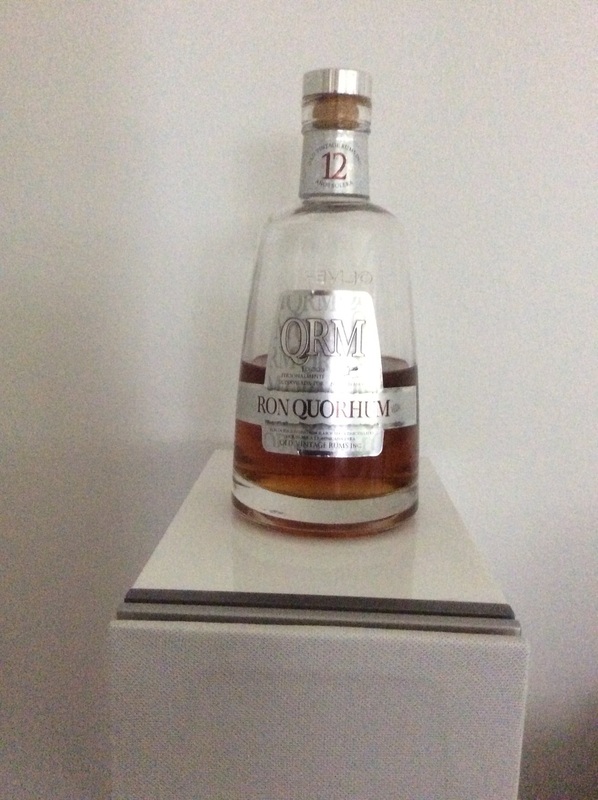 I like Quorhum rums (though the added sugar is 30g+ per bottle, similar to Diplomatico ones). But the sweetness here is balanced with a chocolate/bitter tones. The color is dark brown probably due to the caramel added. It feels good in the mouth, throat and long after... still with the bitter lasting taste. Personally I would rate the 23-year similar to this one (like 8.5) and the 30-year somewhere between 9-9.5... so choose depending on the price, they are all great. This one is to thin in taste and body, 15 year slightly better. I have been looking forward to trying Ron Quorhum and this didnt disapoint. Very smooth and full bodied , plenty of honey tones and not too much alcohol burn , based on sugar cane and not molasses so not much aroma.I could do this straight but also very good with ice and a premium cola. I would love to try some of their older rums but not available here in NZ. This one i preffer with cola. A good value Dominican slolera rum. The nose offers light caramel, raisins, a bit of oak and almost has a subtle "freshness" to it, perhaps due to the fact that the rum is based on sugarcane juice and not molasse. The medium bodied palette treats you with balanced sugarcane sweetness, light oak and fades into a few spicy tingles. There's no dryness, like you might expect from the canejuice production. It's not complexity overload but overall it's nice from start to finish. Très bon rhum de dégustation bien qu'un peu trop sucré. QUORHUM 12 has a good taste, the swetness is perfectly balanced. This is an inexpensive rum and I bought it with an additional discount. However, there is a strong sharp alcohol taste, which is very unpleasant. As this is the entry level, I expect betterstuff in the older Quorhums. In der Nase sehr elegant und erwachsen. Düfte von Karamell, Kakao und Holzschnitzel bauen eine interessante Spannung auf, Vanille und reife weisse Früchte mischen sich mit Honig und Gewürzen um dem Ganzen eine schöne Tiefe zu geben. Im Gaumen eine typische Oliver Zuckerwatte mit einer prickelnden Frische. Karamell bleibt der Leader, Schokolade, weisse Trauben und zarte Holztöne stehen beiseite. Im Abgang bleibt das prickeln auf der Zunge, begleitet von Schokolade und Vanille. Ein durchaus leckerer Ron Solera mit Profil und nicht so süss wie andere Oliver's. Honey-yellow amber in the glass. Very elegant and mature nose. Fragrances of caramel, cocoa and wood chips build up an interesting tension, vanilla and ripe white fruits mix with honey and spices to give the whole a nice depth. On the palate a typical Oliver cotton candy with a sparkling freshness. Caramel remains the leader, chocolate, white grapes and delicate wood tones stand aside. In the finish, the tingling remains on the tongue, accompanied by chocolate and vanilla. A quite tasty Ron Solera with profile and not as sweet as other Oliver's. Still it have a great scent and sweet taste, but not as smooth as it bigger brothers. Ron Quorhum 12y is in the same looking high end bottle as its older siblings, but that's where the similarities end. 12y has a decent semi dark color, quite a strong alcohol smell, very sweet and vanilla laced flavors, and a bit of a burn at the end. Not a bad rum in isolation, but there are so many tastier rums out there in the same $45-50 price bracket. Quorhum is a good brand. This is their lowest rum and you can recognize it. It is better to pay more for older version. Première approche de maison quorhum par l entrée de gamme. On est dans ce que j aime, un rhum assez sucré plutôt facile à boire malgré une présence de l alcool. Je ne suis pas spécialiste. J aime bien son attaque mais il manque peut être d un peu de rondeur et d explosion de saveur en milieu de bouche. Pour ce prix là je le trouve très correct (autour de 37€ chez Leclerc). Ganz in Ordnung aber nichts besonderes. Hätte mehr erwartet. For now I can only compare this to the 30-year QRM, which is more than double the price. The color of this one is a bit lighter than the 30-year. The nose is pleasant. Not too much alcohol, sweet (sweeter than the 30y). Taste is quite light with a bit of a burn of alcohol. It's a beginning of the 30y, which has more flavour to it. All and all I like this one well enough. But still willing to pay more for the 30-year old. Ein feiner milder Rum mit einer leichten Süße. Für ca. 28€ ein topp Preis Leistungsverhältnis. Gefallen hat mir ausserdem die sehr schöne Flasche. Det er en super god 12års rom. Super god. Fanside rom. Very pleasant rum even it is only starter in Quorhum aged lineup. Aroma after oak casks. Very mild in mouth. Taste with tones of toffee and vanilla. Menthol taste and a very good run. Specific one but recommended.